From the spring 1951 issue of World Forum (number 1 volume 5 pages 6-7). Available as PDF. Learn more about Leslie Cross and the history of veganism. 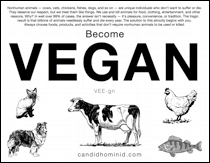 Recently the Vegan Society adopted revised and extended rules which among other things clarify the goal towards which the movement aspires. "The object of the Society shall be to end the exploitation of animals by man"; and "The word veganism shall mean the doctrine that man should live without exploiting animals." The Society pledges itself "in pursuance of its object" to "seek to end the use of animals by man for food, commodities, work, hunting, vivisection and all other uses involving exploitation of animal life by man." Membership its the Society is available to all who wish to see the object achieved and who undertake to live as closely to the ideal as personal circumstances permit. An Associate makes no promise as to behaviour but declares himself in agreement with the object. The door is thus widely opened, and the Society welcomes all who feel able to support it. Direction and management of the Society's work, however, rest with the members. The effect of this development is to make veganism unique among movements concerned with animal welfare. For it has crystallised as a whole and not, as are all other such movements, as an abstraction. Where every other movement deals with a segment — and therefore deals directly with practices rather than with principles — veganism is itself a principle, from which certain practices logically flow. If, for example, the vegan principle is applied to diet, it can at once be seen why it must be vegetarian in the strictest sense and why it cannot contain any foods derived from animals. One may become a vegetarian for a variety of reasons — humanitarian, health, or mere preference for such a diet; The principle is a smatter of personal feeling, and varies accordingly. Veganism, however, is a principle — that man has no right to exploit the creatures for his own ends — and no variation occurs. Vegan diet is therefore derived entirely from "fruits, nuts, vegetables, grains and other wholesome non-animal products," and excludes "flesh, fish, fowl, eggs, honey and animal milk and its derivatives." In a vegan world the creatures would be reintegrated within the balance and sanity of nature as she is in herself. A great and historic wrong, whose effect upon the course of evolution must have been stupendous, would be righted. The idea that his fellow creatures might be used by man for self-interested purposes would be so alien to human thought as to be almost unthinkable. In this light, veganism is not so much welfare as liberation, for the creatures and for the mind and heart of man; not so much an effort to snake the present relationship bearable, as an uncompromising recognition that because it is in the main one of master and slave, it has to be abolished before something better and finer can be built. Veganism is in truth an affirmation that where love is, exploitation vanishes. It possesses historical continuity with the movement that set free the human slaves. Were it put into effect, every basic wrong done to animals by man would automatically disappear. At its heart is the healing power of compassion, the highest expression of love of which man is capable. For it is a giving without hope of a getting. And yet, because he would free himself from many of the demands made by his own lower nature, the benefit to man himself would be incalculable.